And now a sale on a new entrant in the world of DSLR lenses, the Irix 11mm f4 lens is on sale for $550 in the Firefly configuration (Joss Wheadon not included) and $725 in the Blackstone configuration at B&H Photo in the Canon, Nikon and Pentax K systems. Yes, Pentax fans lucked out this time, they made a K-lens as well as CaNikon! This is a limited time sale. Expiration date unknown. For more action, check the B&H Featured sales. A new week has arrived which means another round of featured USED Weekly Sales at KEH has been added. These are eligible for 25% off with permanent coupon KEHDEALS and continue until Friday night of the same week (eg Friday 9/29/17 in this case). Prime time for Pentaxians! The new condition Pentax SMCP-FA 31mm f1.8 AL Limited is on sale for a limited time for $997 with free shipping at Adorama and B&H Photo and Amazon. Pancakes are being served at Cafe Pentaxian! Pentax has a new K-P bundle, it’s the silver K-P body only bundled with the 40mm f2.8 XS pancake lens, together going for the very specific price of $1176.90 with free shipping. This is marked as a “Coming Soon” item at B&H Photo. The little pancake lens itself, the Pentax DA 40mm f/2.8 XS is a special order with a 7-14 business days estimate for $227 with 4% promotional rewards. If you don’t want to buy them together as a kit, the silver K-P body only goes for $949 on its own. Pentax K-Temptations! A total of 20 Pentax K-system lenses are currently participating in a new Pentax Instant Savings promotion at B&H Photo, featuring a mix of primes and zooms, big and small, with prices ranging from $272 to $1997. APS-C shooters, unite and take over! The new condition Sigma 10-20mm f3.5 EX DC HSM is on sale for $399 with 4% promotional rewards (around $16 to be spent in future purchases) at B&H Photo in the Canon, Nikon, Sony A, Pentax and Sigma SLR systems until 8/31/17 at 11:59pm ET. 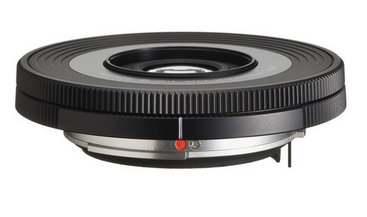 Or if you prefer lens-y accessories instead of 4% promotional rewards, you can get it for the same price at Adorama. The Pentax K-70 body only goes for $600 at various places (eg Amazon), but if you prefer a “Take Pictures With” kit, you can get the K-70 with the 18-55 f3.5-5.6 AL WR DA-L for $697 with free shipping at B&H Photo and Adorama (with free Lowepro, 16GB SD and accesso-trinkets). If you like silver DSLR-looking DSLRs, the new condition silver color scheme Pentax KP APS-C AA-Filterless DSLR is on sale for $1028 with free shipping at B&H Photo and Amazon by Amazon itself (limit up to three per customer). Pentax now has a 35mm full frame DSLR, but it goes for twice as much as their APS-C DSLRs. Which brings us to the Pentax K-3 II Body Only currently on sale for $846 with free shipping at B&H Photo and Amazon itself (limit three per customer). On the other hand, if you also want the official D-BG5 Battery Grip and the AF-200FG flash, you can get them all together for $899 with free shipping by Adorama and by Adorama thru Amazon (Prime-like shipping speed for Prime members even though it ships directly from Adorama). B&H Photo is running a Pentax Lenses Instant Savings promotion with a total of 20 lenses featured with prices ranging from $272 (35mm f2 FA LA LA LA LA LA) to $1997 (150-450mm f4.5-5.6 DC AW D FA HD). The price you see is the price you pay. It is a mix of primes and zooms, with primes having a government-forming majority. Put on some Tammy Wynette because it’s Tamron time! The 28-75mm f2.8 XR Di LD IF MACRO is on sale for $399 with free shipping in the Sony Alpha Minolta Dyxum Maxxum Paxum mount, and $439 with free shipping in the Canon, Nikon and Pentax systems. You also get 4% promotional rewards. This ends Friday night at B&H Photo. The new condition Pentax KP Body Only kit is bundled with the Pentax 50mm f1.8 DA lens, in either the silver or black camera color schemes for $987~ with free shipping at B&H Photo and Adorama. The Pentax K-1 body only 35mm full frame DSLR is currently on sale for $1707~ with free shipping at B&H Photo (with free 64GB Extreme SDXC, shoulder bag) and Adorama and Amazon itself (limit three per customer). The Pentax K-1 Body only is bundled with the Pentax D-BG6 battery grip, together going for $1784 with free expedited shipping at B&H Photo. The K-1 was one only a few cameras to actually go up in price after it came out at $1800. But right now it’s slightly below its original price (and that’s before you factor in the value of the battery grip included for FREE for a limited time). Pentax fans were not left out of these brand new third-party lenses. Some of the new Irix prime lenses are now in-stock and ready to ship at Adorama. Check each individual lens for availability on it. These are DSLR lenses available in the Canon, Nikon and Pentax K DSLR systems. There are two prime lenses, a 15mm f2.4 and a 11mm f4. Each lens comes in two variations, a Firefly, and a higher-quality Blackstone (costs $200 more than the Firefly equivalent). There is a table at the aforelinked page with the differences between the two lines. If you are comfortable with used camera gear, the Pentax K-1 full frame DSLR is available in “Used – Excellent Plus” condition for $1639 plus shipping at Adorama. The new condition price is $1800 at authorized dealers. Adorama offers a 30-day no-questions asked return policy on Used items, and a 90-day warranty covered by Adorama (not Pentax). If you prefer a lower price for a higher risk purchase, you can get it in “Used – Very Good” condition (with various imperfections) for $1571 at Amazon Warehouse Deals (AWD) by AWD itself. Note however that AWD only offers a 30-day return policy. They do not offer any warranty. Now that Pentax has a 35mm full frame DSLR (or have I imagined it? ), they have to also manage a parallel product line with their more populous APS-C line. [[ insert more camera-babble talk here ]] Which brings us to their new Pentax KP APS-C DSLR that was announced in late January 2017 [see Cameras and Lenses of 2017 tracker]. The DSLR kits are now in-stock, and on top of that, the kits that include lenses are discounted from the original price. The body only though remains at $1100. The used Tamron 17-50mm f2.8 Di-II LD SP AF mentioned yesterday is long gone, but the new condition is available for a reasonable price for an f2.8 APS-C zoom lens, $300 gets you this lens in the four SLR systems (Canon, Nikon, Pentax Sony Alpha Minolta Dyxum Maxxum Kraxum). At Adorama you have a choice of 4% promotional rewards or free lens-y accessories, while at B&H Photo you get 4% promotional rewards. These are new condition with a 6-year Tamron USA warranty. NOTE: this is the older non-VC (non-stabilized) version. While the Pentax D FA 24-70mm F2.8ED SDM WR Lens for $1032 lightning deal oscilates between 100% Claimed and not, this K-mount bundle is available on a conventional basis, Adorama has a Pentax K-3 II Body Only Bundle with the D-BG5 Battery Grip and the AF-200FG shoe-mount flash, all together for $899 with free expedited shipping. The Pentax K-1 was a long-time coming type of a unicorn-camera, so it shouldn’t be a surprise that even with its release, it defied conventions. Its price went up +$150 after its initial release at $1800, but it’s starting to come down again, you can get it for $1847 with free shipping and a handful of free accessories (Corel Software Bundle, 32GB card, tripod, case, card wallet, cleaning kit) at Adorama. Prime time for Pentax fans. The new condition 50mm f1.8 DA lens is on sale for $99 with free shipping ta Amazon by Amazon itself. You can buy as many as you want (technically the limit is 30, but I doubt any non-reseller would need more than 30). $300 is all it takes for an APS-C f2.8 zoom lens these days. The Tamron 17-50mm f2.8 XR Di-II LD is currently on sale for $299 with free shipping at Adorama in the Sony Alpha Mount (Tiffen filter, Corel software, etc) or the Pentax K-mount with $12 promotional rewards but no other extras. This is not a stabilized model, which partially explains the price difference between it and the “VC” (stabilized; Vibration Correction) model. Cette daily deal du jour est expireaux… While putzing around the internets I landed in the Amazon France Gold Box where one of their current deals of the day is the Pentax K-3 with 35mm f2.4 offered for 669 Euro. Offer ends by 6pm Eastern on Wednesday (or earlier if sold out). Prices include TVA (I’m assuming that’s VAT). The $1800 launch price is not coming back any time soon for the Pentax K-1, but you can get effectively close with this Adorama K-1 bundle for $1950 with free shipping. For this, you get the Pentax K-1 body only kit, a $100 Adorama gift certificate, a 32GB Sandisk ExTrEmE SDHC card, the Corel software bundle (AfterShot PRO 2, Paintshop PRO X9, VideoStudio 9, etc), the Lowepro Format 160 camera bag, an Adorama slinger bag, tears of a unicorn, a 66-inch Takama tripod, and a cleaning kit. 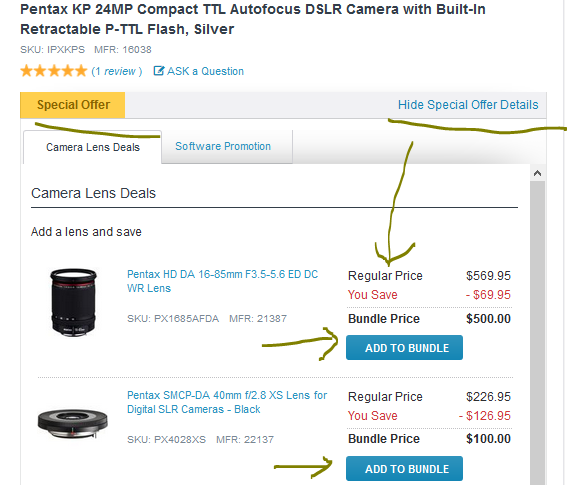 Optionally, when you expand the yellow “Special Offer” section, you can get combined purchase discounts when you purchase this with select Pentax DSLRs lenses, or you can add the Pentax D-BG6 battery grip for +$117, or add Elements 15 for +$39. For more offers, check the latest Adorama Specials. Triple figures tilt-shift lens action now, at B&H Photo, you can get the Rokinon Tilt-Shift 24mm f/3.5 ED AS UMC for $699 along with 2% promotional rewards (around $14 to be used in future B&H purchases) in the Nikon and Pentax SLR systems and the Sony E mount. PS: the letters at the end of blog-post titles are abbreviations for the various mounts, N = Nikon; K = Pentax K, E = Sony E, C = Canon, A = Sony Alpha A, NX = Samsung NX, Si = Sigma stubborn SLR mount, M43 (self explanatory), FT = Four Thirds, etc. While surfing around the eBay Deals, this surfaced, in USED good condition, you can get the Pentax 50mm f2 SMC A K-Mount lens for $15 with free shipping, sold by Roberts Camera (99.5%, Indianapolis)… You can also try to officially negotiate a lower price using eBay’s “Best Offer” feature. As of 11/20/16 recheck, this is back to “temporarily out of stock” (TOOS) but you can order it if you want to lock up the $80 price with free shipping, “it” being the new condition Pentax 50mm f1.8 DA lens at Amazon by Amazon itself for $80. That’s a pretty good price for a digital-era normal prime lens.